Been to Birkenhead today. My wife and I are cooking up an idea to build a tramway on the windowsill in the conservatory. 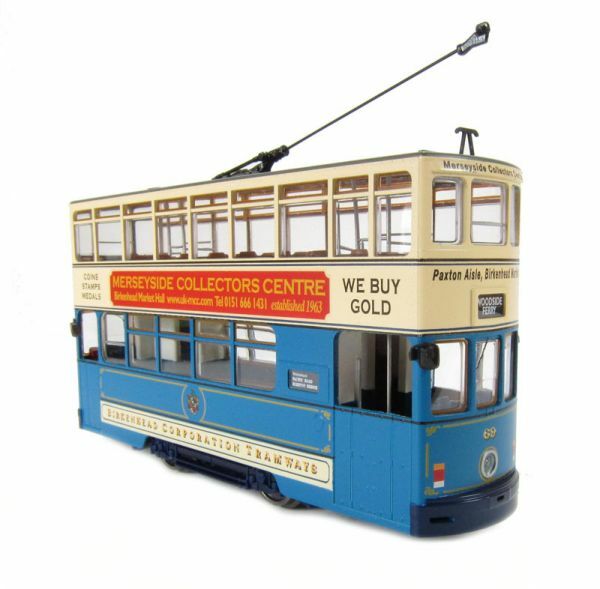 Bachmann have just released two Birkenhead trams. Plans may change tomorrow once we gt to Blackpool. Well that's it then... no stopping you now! Looks a nice model. Indoor modelling would seem to be the perfect summer pastime so far this year! I'm looking forward to seeing how your tramway progresses. I'll call at 'Amblethorpe' one nice Sunday. British Summer Time is over, officially. I've already started making and bashing some Metcalfe kits for the tramway. I've started to put some serious thought into the track plan. I have two windowsills in the conservatory. One is about 2.5m and at eye level. The other is at a more traditional low level and about 5m end to end, but an "L" shape. Most of the time the tramway will be on the high sill, but I want be able to run it on the low one from time to time. The plan is to build it on two boards about 1200mm by 200mm to make it easy to handle and to allow me to insert a corner section between the two boards when I place it on the low "L" shaped sill. I'm also thinking about having extra boards which could go on each end when on the low sill. They could be loop backs (think Fleetwood) to enable continuous running. I like to have a full plan before I start, it gives me direction and a framework to work within. I'm looking forward to this too. A small easily manageable indoor project sounds like a great idea for the winter months and a tramway rather than a railway will be very interesting. Could you post a photo of a tram next to a loco so we can gauge the difference in size? I've always looked upon model trams being much smaller than a similar scaled loco but I suspect they're not as small as I've imagined. Good dry day today so got my tram out with a couple of trains and snapped a few photos. I've put some in my gallery but here's an end on shot to give gauge comparison. Is the tram going to be just for indoor use? I doubt that a working tramway would fit in with your timescale outdoors unless you were to model one in a preserved condition - which might be something you could think about perhaps. The photo above includes models spanning the last century so you're almost there already. I wonder if anyone models an OO gauge outdoor tramway? It's DCC now, so it will have a run out, even though it wont fit in. An garden tramway would be interesting. I've not run my tram on incline, but I understand they are good runners up hills which would lend to all kinds of fun in the garden. Scale distances between stops, tight radius bends, it's starting to sound like a perfect match. It rained, on a Sunday. I can't remember the last time that happened. Garden access is going to be hit and miss for the next few months. Thoughts turn to winter projects. Today I worked on adding a lot of lights to my Pacer, not an easy job, but my main winter project is the tramway. We were back at Birkenhead last Sunday for their festival day and the timing was good for inspiration for my winter project. Things stalled last winter because I didn't get round to making the baseboard. Procrastination. A lot of model buildings were constructed and are ready to plant. I think I've decided how I'm going to model the track. If I can get my mate to give me a lift to B&Q for some baseboard MDF then I may make some progress. Sarah received a tram for Christmas, I don't think I need to say who gave her the gift. We now have two Birkenhead Trams, which is all the rolling stock we need. The plan for the first couple of baseboards is shown here. Running will be very simple. The Up line is the top one, with the Down below. A tram will arrive at Stop 2 on the Up. It will reverse and cross to the Down. On arriving at Stop 1 it will reverse and cross onto the Up line to Stop 2. The stops will be large enough to take two trams which give a little operational flexibility. It will be DCC, so prototypical running, trams chasing each other, will be possible. I'm also thinking about automatic running in some-way-shape-or-form. I do like to think ahead with my projects and make passive provision for future expansion. The idea is to make loops for each end (boards 3 and 4) and a middle section (board 5) with a right angle bend. These would create a lot more playability. But boards 3, 4 and 5 are for the future. I need to crack on and get boards 1 and 2 constructed. Every girl should have a tram! What a lovely present - you are so thoughtful. I'm looking forward to seeing the tramway as part of the forum and I'm sure that you and Sarah will make an excellent job of it. How on earth hve I missed this thread? You cn make trams run a loop on DC with automatic stops. The tram will stop on it's own at the stop, and wait until another comes up behind it, when it will move off. The second tram will then stop at the stop until another comes behind it when it will move off. A simple switch will over ride it if there is no following tram. Same can be applied at crossovers to avoid collision on a figure eight layout, or where street width allows two tram track to overlap each other. Common practice when they were running. I lived in Ramsgate and fell in love with the idea about 1999/2000. I am now looking at and not liking the Sunderland system. Perhaps I should do Ramsgate in Sunderland. There is a serious chance that I may actually make the baseboards for this in the next few weeks. Track for the tramway has been purchased. I may have a busy weekend of modelling ahead. Considering the state of the weather I'd say that's a wise choice Chris. Looking forward to seeing it all progress.